A body is found floating in a lake, the circumstances surrounding the death a complete mystery. One might assume the cause of death to be drowning, and for this there may be certain pathological indicators. But failing these indicators, how can you be so sure that the victim drowned? It could be that they were killed elsewhere, their body tossed into the lake to eliminate suspicion. Or perhaps they did drown, but in alternative circumstances in another body of water. The scenarios are endless. But how can these questions be answered? The key to this problem might just be a diverse group of microscopic algal organisms known as diatoms. Perhaps you’ve heard of them. These asexually-reproducing organisms exist in a vast variety of shapes, sizes and colours, plentiful in many aquatic environments and existing in a tremendous range of populations. A particularly important feature of diatoms is their silica-based cell wall, producing an especially distinctive appearance that can vary greatly between different species. This cell wall enables diatoms to be particularly resistant to decay, so they may persist in an environment for a long time. It is their abundance, uniqueness and resistance that has allowed diatoms to be of such great use in the field of forensic limnology, that is the study of freshwater ecology in a legal context. So how can these minute microorganisms help determine the circumstances surrounding a suspicious death? Imagine a person drowning. As the head is submerged, water is inhaled into the lungs, along with any microorganisms contained in that water. In this case, diatoms. So the presence of diatoms in the lungs proves death by drowning? Not at all. Water can passively reach the lungs regardless of whether the victim was dead or alive by the time they reached the water. However if the victim is alive, when diatoms hosted by the water reach the lungs, they will be circulated around the body via the bloodstream, being deposited in different bodily tissues and internal organs. So with this in mind, the investigator may be able to conclude that cause of death is likely to have been drowning if these diatoms are detected in the internal organs. 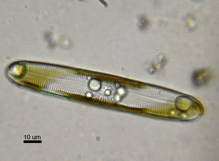 At this point it is necessary to note that diatoms may already exist within the body, as these algal communities are found in various environments other than water. It is therefore necessary to establish a kind of match between the diatoms in the suspected drowning medium and those inside the body of the deceased. By studying the species of diatoms present and their abundance, it may be possible to conclude whether the diatom populations are consistent with one another. Interestingly diatom populations can also vary seasonally, thus may be able to provide some insight into the time of year in which a victim drowned based on the diatoms extracted from the remains. Comparisons such as these can be made by collecting water samples and extracting diatoms from bodily tissues and internal organs (often through acid extraction), before comparing the diatoms using light or electron microscopy. The possible applications of the study of diatoms is by no means limited to these scenarios. Numerous features of diatoms make these microorganisms an ideal focus for analysis in forensic investigations. Their minute size means that they can be readily transferred from the crime scene by objects or people, with perpetrators unlikely to be aware of the presence of these organisms. The resilience brought about by the silica-based cell wall allows for them to persist in the human body even beyond later stages of decomposition, during which time cause of death by pathological means may be more difficult. The distinctive morphology of diatoms allows for species to be distinguished from one another, and their abundance and variation results in different bodies of water developing very distinctive assemblages of diatoms. Unfortunately the use of diatoms as an indicator of cause of death by drowning is somewhat controversial, highlighting the need for further research in this area of study. Horton, B. P. Boreham, S. Hillier, C. The development and application of a diatom-based quantitative reconstruction technique in forensic science. 2006. University of Pennsylvania Scholarly Commons. Krstic, S. Duma, A. Janevska, B. Levkov, Z. Nikolova, K. Noveska, M. Diatoms in forensic expertise of drowning – a Macedonian experience. For Sci Int. 127(2002), pp. 198-203. Pollanen, M. S. Diatoms and homicide. For Sci Int. 91(1998), pp. 29-34. Scott, R. S. Morgan, R. M. Jones, V. J. Cameron, N. G. The transferability of diatoms to clothing and the methods appropriate for their collection and analysis in forensic geoscience. 241(2014), pp. 127-137.